In the last four years I have learned an incredibly large amount of information about autism. In varying degrees my son is affected by difficulties in social interaction, verbal and nonverbal communication and repetitive behaviors. I remember the first time I took him on a roller coaster ride at six flags. It constantly spins as it goes up and down deep inclines. Spinning is one of his favorite activities to do at home. I figured this would be a win for him. His communication difficulties totally came to the forefront. He sat there with this intense look on his face (The same intense look in the first picture I got of him on his FAVORITE ride the big red train) and I was just positive that he was about to burst out screaming. We got off the ride, he looked up at me and said, “Mommy, can we ride that again?” The “Pandemonium” is on of the rides that he now perseverates on. We can’t only ride it once. 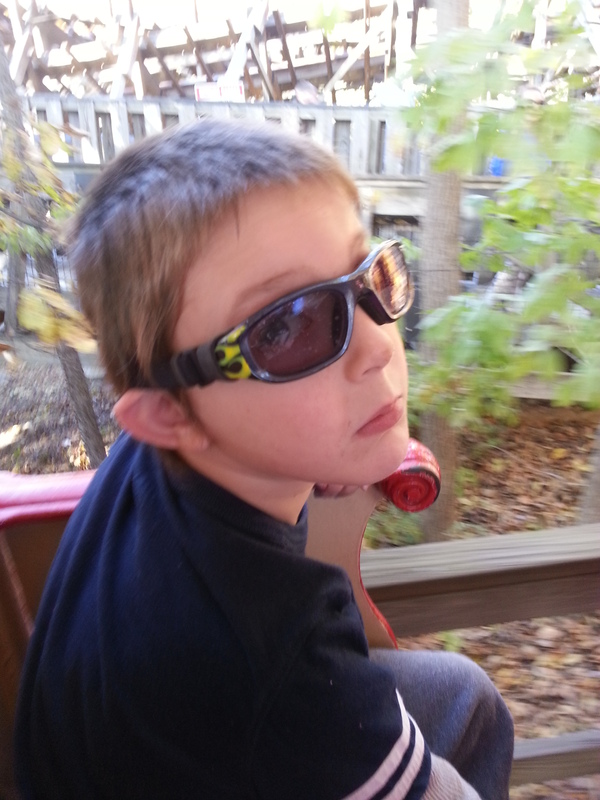 Each time we rode the train, or a roller coaster his facial expressions did not match what he was feeling. I attempted an experiment. I don’t laugh on roller coasters, I scream. I decided that instead of screaming (that kind of freaks him out) I would laugh and giggle. What would happen? Would he start to laugh and giggle too? Sure enough after a few times of watching Mommy he started to laugh. Not his sincere, from the gut, brighten the entire world around him laugh – but his “okay, everyone else is laughing so I should be too” kind of laugh. It was a start. It was almost like he had to learn how to laugh on the roller coaster, and I was his teacher. I didn’t feel like laughing (I REALLY WANTED TO SCREAM), but I knew that inevitably that is what he wanted to be doing. He just didn’t quite know how to express that emotion. This past weekend was the last weekend of the season at the park. We took all three kids. 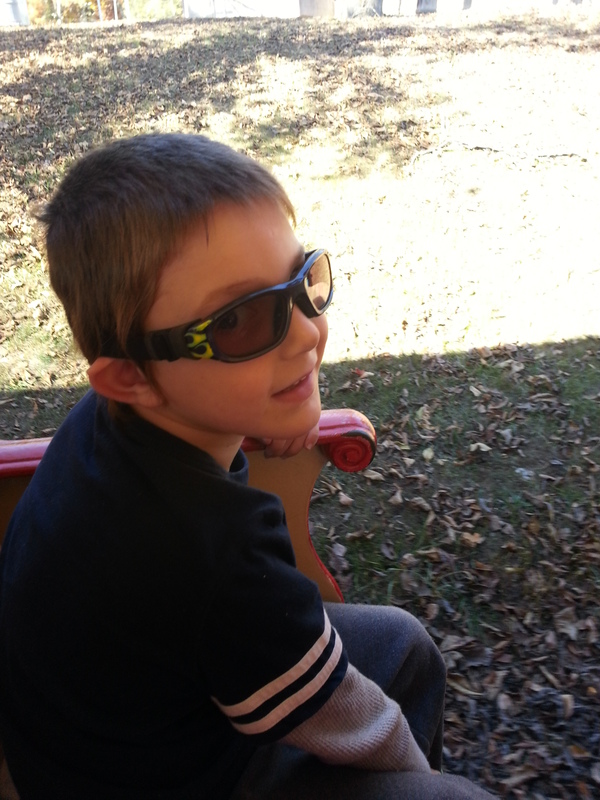 They had a blast, and we made sure that Chase got a chance to ride on “His big red train” (just trust me, it is HIS). I found it fascinating watching him really enjoy his ride. I let him enjoy it. I asked him if he was having fun. In his intense voice he said “Yup.” I held back the urge to say “Well, then smile” He looked at me, and then he looked up at his father – who is also a train fanatic – and smiled. It was a sweet smile. I am so fortunate that I got to capture that smile on camera! 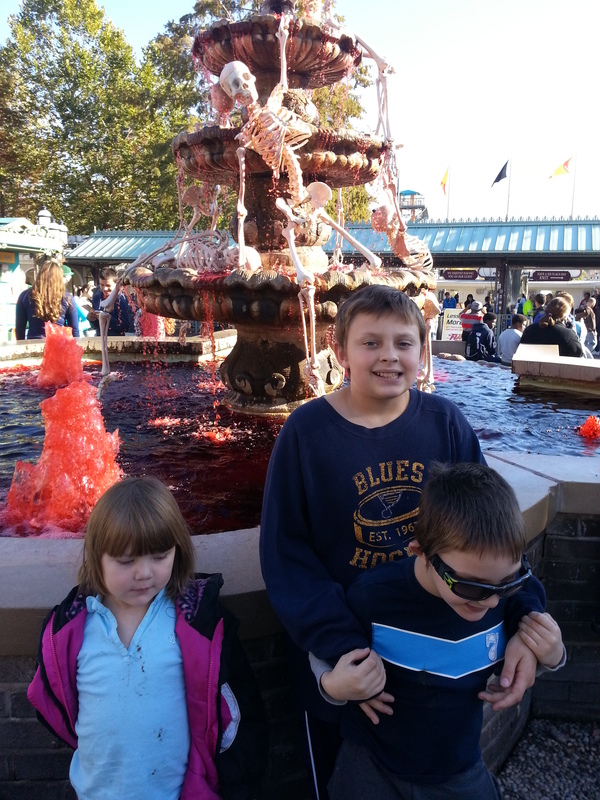 Finally as we left the park the kids wanted to go look at the water fountain dripping in red. It kinda freaked me out – especially when they wanted to drink from it, led by their big brother (who thought it was fruit punch). Here I caught another great smile. Gavin was trying to run away from his brother, and Donovan was holding on to him. Gavin thought that was really funny!! !